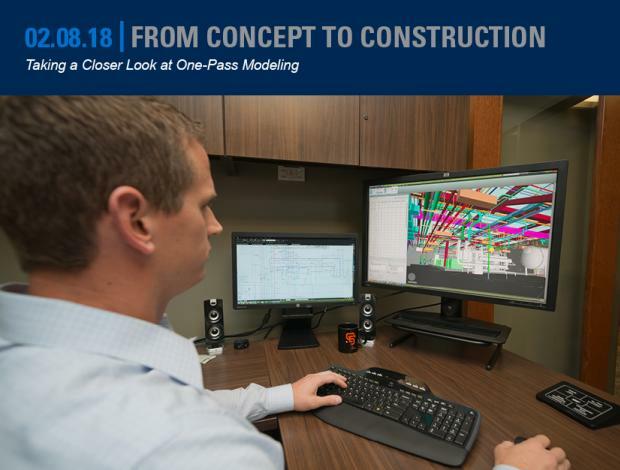 The introduction of Building Information Modeling (BIM) revolutionized the construction industry and we still see improvements to projects as it continues to evolve. In our neck of the woods, elements of BIM are part of every greenfield construction project and with the advances in laser scanning technology, BIM has also become a useful tool for renovation/remodel projects as well. The advantages of applying BIM to the construction process are well known and many contractors are utilizing it to enhance and streamline areas like spatial coordination, prefabrication, material take-offs, and layout. While we embrace these benefits, we are taking it a step further and utilizing BIM in preconstruction. As our industry advances, we look for practical ways to improve existing processes with new ideas. At MMC, we have seen great success utilizing a one-pass model approach. In a one-pass model approach, we take the design team’s schematic model and create a construction model. On multiple projects it has reduced the time required for the design phase, which enables construction to begin much earlier and saves the project valuable time and money. In addition, we now have a full construction model that is populated with manufacturer specific items and labor information — an added benefit to the design process. This allows timely and accurate analysis of multiple design options and VE opportunities. MMC’s BIM model is an exact virtual representation of what we install in the field, populated with manufacturer specific items. Because the model that we work from needs to contain specific information for construction, we usually end up redrawing our systems from scratch. We often only end up using the design model as a rough guide for layout of the systems. This highlights one of the biggest flaws in the typical design-bid-build process — all of those wasted hours by the design team in generating a model, which we almost always need to redraw. When we can utilize BIM during the preconstruction phase of the project, we are able to work in tandem with the design team, taking their conceptual/schematic designs and using them to create the three-dimensional construction model. By taking this “one-pass” approach to modeling, we can allow the design team to focus on system design, rather than getting bogged down in model creation. In addition, early involvement of MMC’s BIM team fosters a team-oriented, collaborative attitude and approach that lasts for the duration of the project. It gives the designers and our field team, as well as the general contractor and other sub-contractors, the chance to get eyes on the construction model well before construction begins. The team can then identify any potential issues well ahead of construction, eliminating costly and time-consuming rework. The value BIM can bring to any construction project is substantial. When we can bring our BIM expertise to the preconstruction phase of a project that value increases enormously.